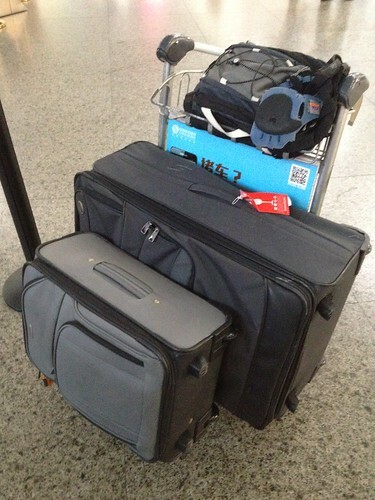 That's the same three bags (right) that I came to the Capital with and now that I am on the move again, it's the same three bags again. As you would have known by now, I was previously staying in my office/apartment partly to save costs but also due to the fact that I will be moving again soon as the current lease expires end of September 2012. As such, I was not able to commit to any tenancy agreement until we firm up where the office location will be shifted. I headed back to HQ leaving my packed luggage in the custody of my manager as he handles the clearing out of the apartment. 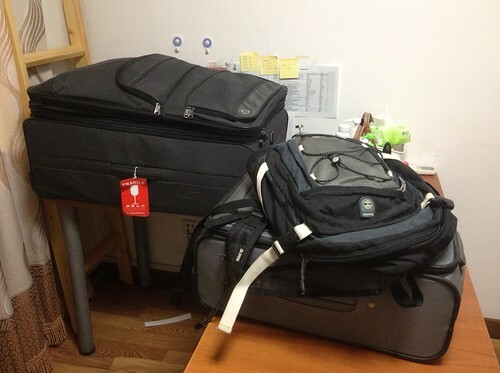 When I get back the week after, I hope we would have found a decent apartment for me to move in with my 3 faithful bags. We went apartment-hunting a few days before I flew south for the holidays. I saw a couple that I liked but management has been bitching about the cost of the rental which I thought was downright stupid. The location is already ulu enough that I have no immediate access to subway network. I was willing to trade off the convenience of transport (take bus lor) for the sake of saving a few rental dollars. What the idiot at the helm failed to understand the Capital is a place where cost of accommodation is god-awfully expensive and yet he chose to bury his head in the sand, using south Ch1na as his benchmark.